Locally brewed craft beer is becoming ubiquitous in Kansas. But 30 years ago, it didn’t exist at all. The Journal looks back at the leadership required when one man who wanted to open a brewery seized the moment to help get it all started. It began as a research project, but it turned into a vision. Sifting through historic documents, Chuck Magerl discovered photos taken in the 1800s of Lawrence’s brewing operations. Fascinated by the idea of small breweries, Magerl put together plans to create his own “free state” brewery and restaurant. There was just one problem: Breweries were illegal in Kansas and had been since 1881. 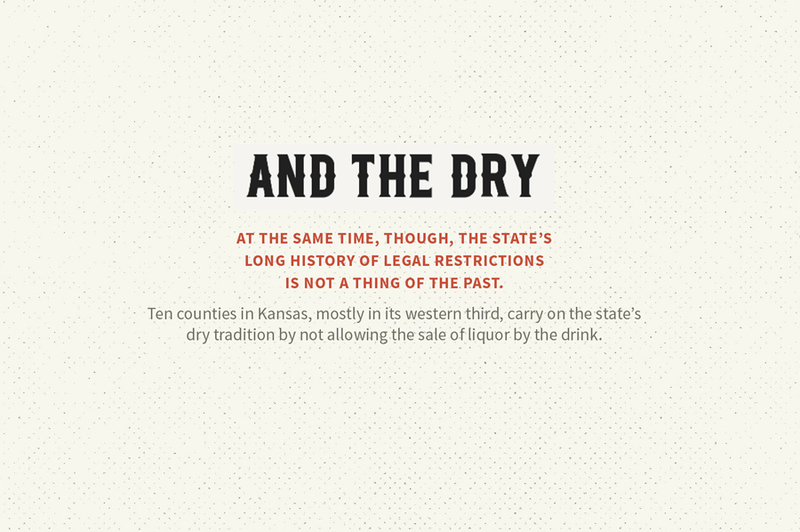 Kansas was the first state in the nation to outlaw alcohol sales and consumption. It had figured prominently in amending the U.S. Constitution to ban the production, transport and sale of alcohol. And though statewide Prohibition ended in 1948, Kansas has yet to ratify the 21st Amendment that repealed federal Prohibition. Magerl’s chance to lead Kansas to those roots came in 1986, when voters approved a ballot measure allowing liquor by the drink in public drinking establishments. Magerl jumped, starting with a letter to a task force looking for public comments on liquor laws. “Once I was able to get a paragraph inserted in the possible changes, I earned a seat at the Senate committee hearings,” Magerl says. As sensible as Magerl’s arguments seemed to him, he found a completely different mindset in Topeka: “It wasn’t that the legislators didn’t want breweries – they just didn’t care. 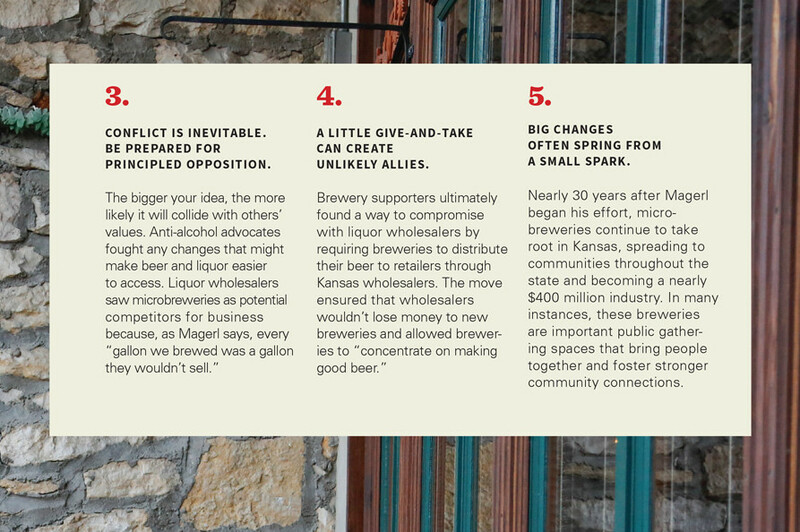 To gather support, Magerl decided to become the face and voice of everything anyone needed to know about Kansas breweries. It wasn’t a role that came naturally for him. “I don’t see myself as an outgoing personality,” Magerl says. “But I’m a good observer. I work hard on knowing what’s going on, gathering information and providing honest material for others to act on.” Magerl set about piling legislators’ desks with information on issues from brewery regulations to taxes to possible effects on Kansas communities. One of the first to embrace Kansas breweries was state Sen. Wint Winter Jr., who introduced a bill on Magerl’s behalf. “If there was one individual who was responsible for getting the bill passed, it was certainly Wint,” Magerl says. Sen. Ed Reilly, chairman of the committee that handled liquor regulations, also came on board, and the proposal began to find traction. 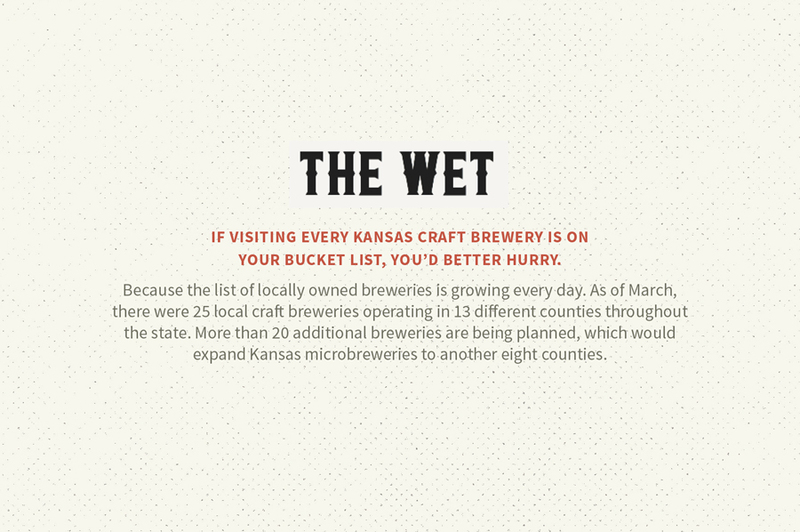 “The language we added stated that beers brewed in the state had to contain at least fifty percent Kansas products. So the issue became a matter of economic development for Kansas farmers,” Duncan says. Still, prohibitionists were a force to be dealt with. Patrons gather around the bar at Free State brewery in Lawrence. The brewery uses a 1902 quote about beer from the diary of Brother Epp of a monastery near Hays on items such as T-shirts. Jimmy Calderon and Bill Woodard, both of Lawrence, enjoy a beer on the Free State patio. Free State brewery is a popular local gathering spot. Towns large and small have been adding microbreweries in recent years. Explaining Taylor’s political approach in The New Yorker, Kansas City, Missouri, native Calvin Trillin wrote, “Realizing that complete prohibition is not a realistic goal, Taylor concentrates on cutting down consumption. When it comes to drinking, he favors inconvenience.” And Kansas breweries would make things far too convenient for Taylor’s tastes. Given voter support for liquor law changes, Magerl’s group was positioned to overcome prohibitionists’ arguments. 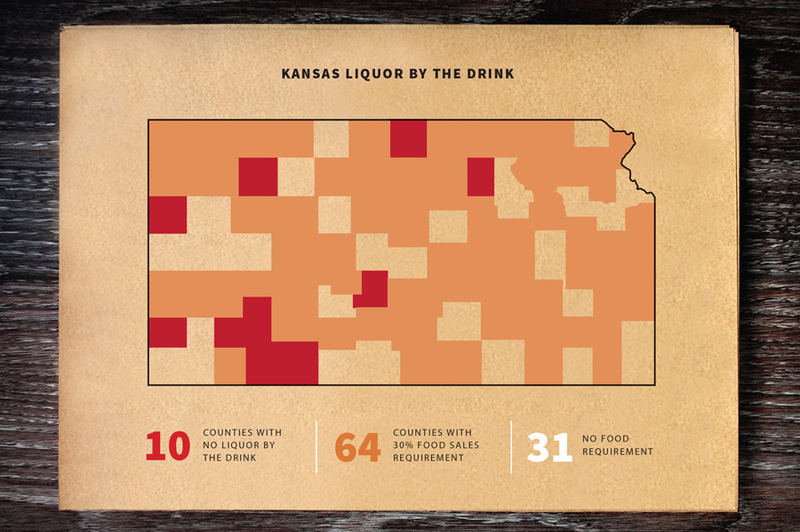 Tougher opposition came from Kansas wholesale distributors, the businesses that purchase beverages from producers and sell them to the retail stores that supply consumers. So brewery proponents offered a compromise. “If microbreweries were going to distribute their beers to Kansas liquor stores, they had to use a Kansas wholesaler,” Duncan says. “That was good for the wholesalers, because they wouldn’t lose money to new breweries. Even with the agreement, brewery legislation almost didn’t make it into the final bundled bill. “It was literally the last day of the session, and it still hadn’t come up for a vote,” Magerl says. In a last-ditch effort to derail the bill, legislators from dry counties demanded that changes in beer regulations be stripped from the bill before the vote could proceed. “I remember standing with Senator Winter and Senator Reilly as they were advocating with the Senate president, saying, ‘Now we’ve had our hearings. We think it’s a good plan. On April 8, 1987, with the beer language intact, the bill did go forward. On a 30-10 vote, the legislation passed and headed to the governor’s desk to be signed into law. 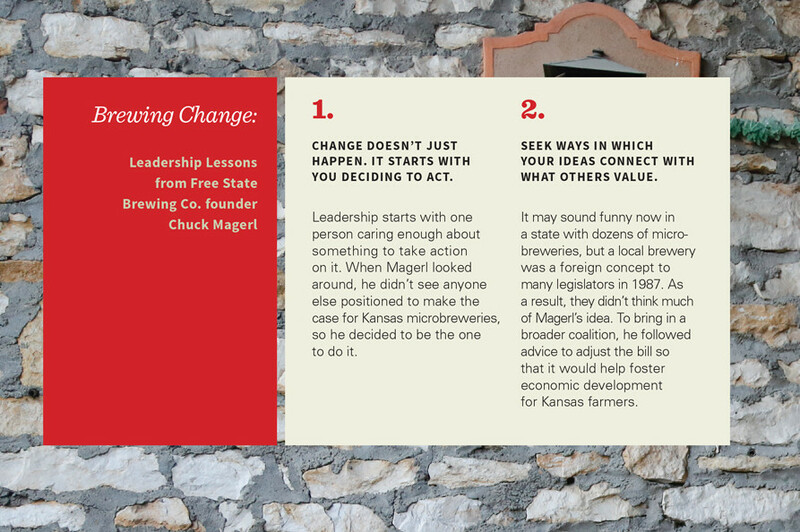 Two years later, Magerl opened Kansas’ first post-Prohibition brewery, the Free State Brewing Co. 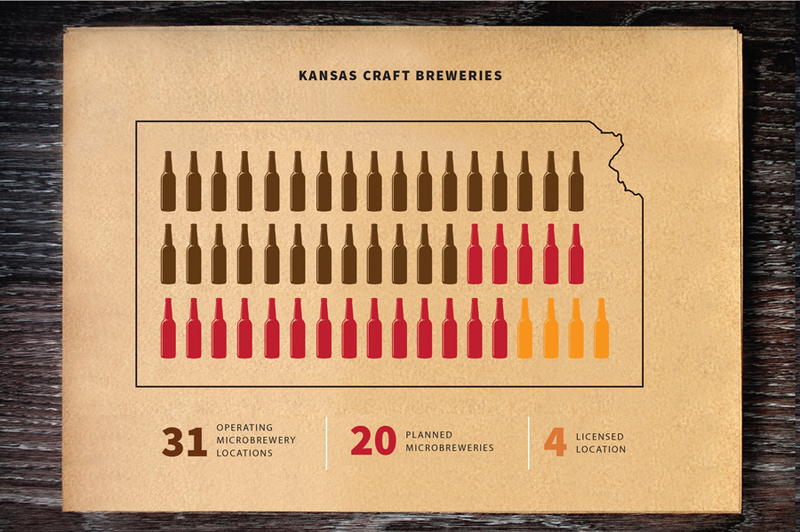 The Lawrence business remains one of Kansas’ favorite destinations, Free State beers are sold throughout the state and 30-plus breweries have followed Magerl’s lead, opening facilities in towns large and small (Click here to view a map of Kansas microbrewery locations). 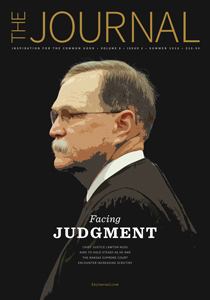 Looking back, Magerl is both proud and reflective of the efforts he led. “In legislation as in life, it’s easier to do nothing than it is to take steps forward. This entry was posted in Business, Leadership, State Government and tagged Business, Civic Leadership. Bookmark the permalink.